Before the snow surprised us here in London earlier this week and turned me into a squealing ball of joy, I had already gotten my first taste of proper winter back in Switzerland that I visited on my recent trip. It was a calming but exciting break from my busy schedule, full of escapes into beautiful nature and charming little towns. 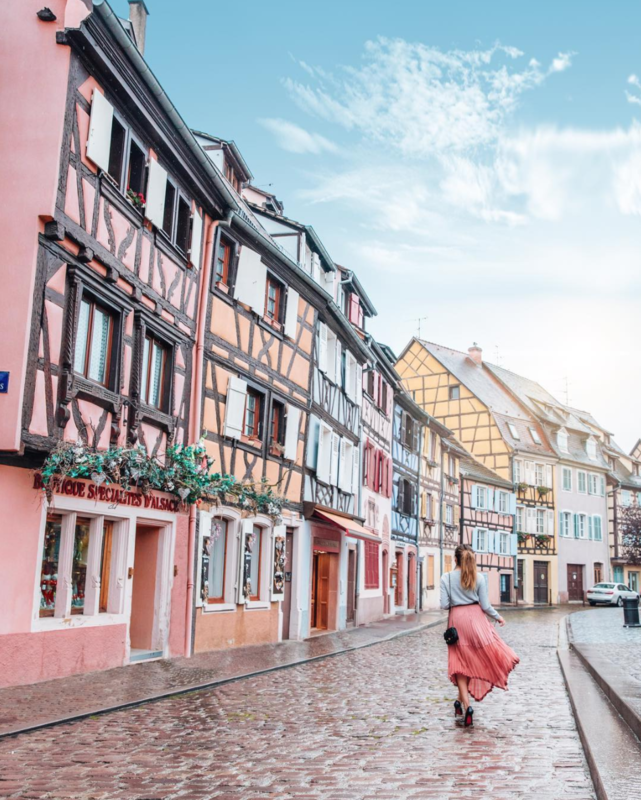 Starting in Basel, we first made a little detour to Colmar, France, a town in the Alsace region with a picture-perfect old town centre. Walking down the cobblestoned streets surrounded by houses looking as if they were straight out of Hansel & Gretel made me feel like I was in a real-life fairytale! If you ever pay it a visit (and you most definitely should), the number one spot to check out is Little Venice with its charming canals, but since you don’t need more than an afternoon to explore it fully, it’s best to just get lost in the streets and discover hidden little corners at your own pace. It’s looking especially beautiful at the moment for Christmas! Your feet are all you need to get around the centre of Colmar, but to reach the rest of the destinations I’m going to mention, I would recommend renting a car, as they’re quite far apart. Blausee, which is another place you should put on your radar, is about two hours away from Basel Airport, and three from Colmar. It’s an insanely gorgeous, serene lake located in the middle of the forest, with crystal-clear deep turquoise water I couldn’t stop staring at! There’s lots of walking paths around and even picnic spots to enjoy, so if you’ll come around during the warmer months of the year, make sure to pack a blanket and some snacks. If you’re looking for the best nearby hotel to either spend the night or the whole week at, The Cambrian Hotel in Adelboden is the answer. With stunning panoramic views in every direction and the most amazing spa with an indoor pool, two saunas, a hot tub and even a heated outdoor pool overlooking the snow-covered mountains which was my favourite part! it provides the ultimate relaxation for your body and soul. My stay was outstanding in all aspects, but besides the glorious pool view, I also need to give a special mention to the friendly staff and restaurant - the modern Swiss food prepared from seasonal regional products was beyond delicious, and they even catered to all my dietary requirements without a problem, which deserves an extra praise in my books. I can’t wait to go back and maybe even hit the nearby slopes next time! It’s the perfect winter wonderland setting. Wearing my cosy N.Peal cashmere which I adore! Shop here. The last see-sight stop on our trip was Hangebrucke Furgangen-Muhlebach, a pedestrian suspension bridge hanging between two valleys, almost 100 metres above the river Rhone. I do have to say it’s not for the faint hearted and, unlike the Cambrian Spa, not the most relaxing experience you can have if you’re dealing with a fear of heights… My legs turned into jelly as soon as I stepped on it and once the whole thing started shaking from people waking up and down, I felt like my heart was skipping beats, but at the end, the view made it all worth it! We then visited another hotel with insane views - Hotel Villa Honegg in Ennetbürgen. A relaxing swim in their heated outdoor pool overlooking the mountains and Lake Lucerne (or the sea of clouds above) was just the perfect end to a perfect trip, and once the sun set and more people started flocking in, the pool became quite the vibe. I was quite worried we wouldn’t be able to see the view as it can get quite foggy so high up but throughout the day the clouds lifted and it was almost clear skies. The pool view is really the main selling point to the hotel, it didn’t have quite the same cosy vibe as The Cambrian Adelboden which is what I usually prefer when I’m in the mountains (but that’s just personal preference!). To see everything in more detail, make sure to check out this video on my YouTube channel and see the rest of the photos on my Instagram over here.